In Yorkshire, as in most other places, spring begins in March. Days get longer, and although snow sometimes falls as late as April, you’ll see plenty of Yorkshirefolk getting their legs out as soon as the mercury pushes 16°C. It’s the season synonymous with flower blooms on the moors, lambing in the dales and rhubarb crumble on pub menus. Magnificent country estates pull out all the stops for Easter and St George’s Day, and quaint towns welcome droves of visitors for growing national events. Although temperatures can still be low in March, it starts to heat up in terms of things to do. 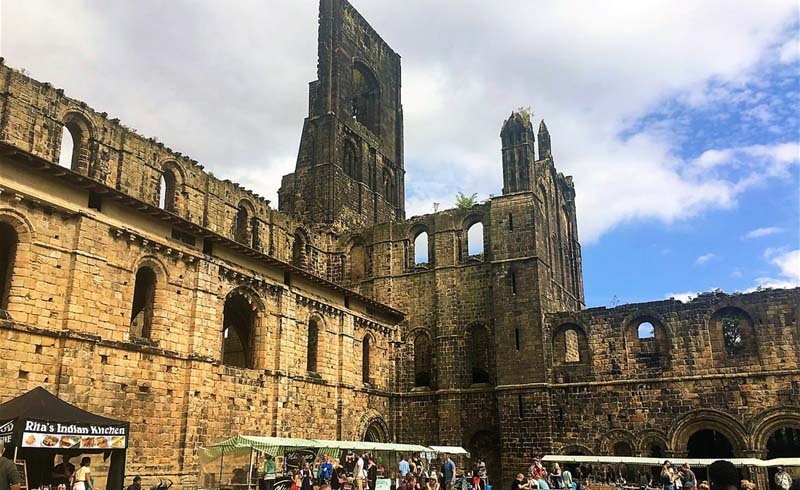 In Leeds, the Kirkstall Abbey Market starts running this month, with street food hawked inside the abbey ruins (usually alongside some Yorkshire gins). The end of the month is marked by the Trans Pride Leeds March, launched in 2018 and Britain’s second only event of its kind (the other is in Brighton). Mid-March to mid-April is daffodil season and Farndale, Yorkshire’s ‘daffodil dale’, transforms into a sunbeam of these quintessentially British flowers. 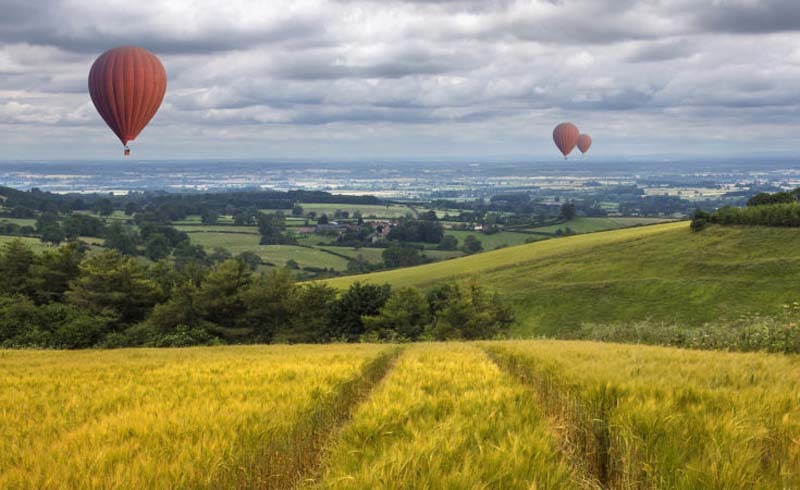 Immerse yourself in them on an easy 3.5-mile linear walk, which meanders through the valley beside the River Dove. The regional calendar gets busier in April, just as the weather gets warmer. A handful of Yorkshire Dales farms open their doors for lambing season, offering farm trails and the opportunity to see newborn lambs being born. Rhubarb becomes the seasonal ingredient on pub and restaurant menus. Goths descend on the historic seaside town of Whitby for the first of the twice-yearly Whitby Goth Weekends. The National Trust arms thousands of kids with maps for Easter egg hunts around old manor houses and country estates. 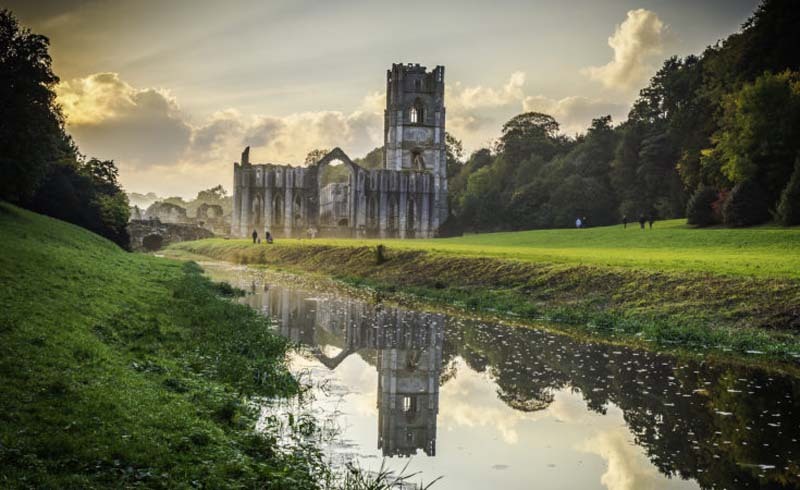 Properties such as Fountains Abbey, Nostell Priory and the Treasurer’s House in York usually take part. 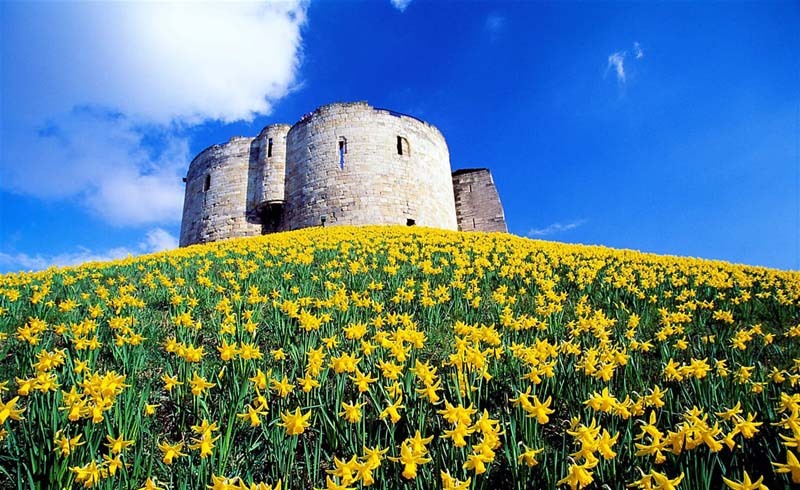 St George’s Day (23 April) is also widely celebrated across Yorkshire, with several heritage houses orchestrating dragon hunts. In 2018, Lotherton Hall, a fabulous country estate and museum on the outskirts of Leeds, installed a ferocious animatronic dragon in a den converted from one of the estate’s stables. The last week of April sees the northern version of the Chelsea Flower Show, held with much fanfare at the Great Yorkshire Showground in Harrogate, put on by the Royal Horticultural Society. York Open Studios, a bit like the Open House events, offers a rare opportunity to visit the studios of artists and artisans that are usually off-limits to the public. Yorkshire has too many beer festivals to count, but in April there are two goodies: the Hull Real Ale & Cider Festival, held by CAMRA inside beautiful Hull Minster, and Hop City in Leeds, an all-you-can-drink affair celebrating hop bombs at Northern Monk. Also in Leeds, North Brewing Co’s weekly Eat North street food, craft beer and DJs fest starts for the season at the end of April. Yorkshire was so enamoured of its hosting part of the Tour de France in 2014 that it now runs its own annual spin-off, one of the most high-profile events of the region. The Tour de Yorkshire puffs through 150 villages, towns and cities on the early May bank holiday. The route changes each year (check the website), but villages in the Yorkshire Dales usually make scenic viewing points. In West Yorkshire, Haworth – the cute cobbled hometown of the Brontes – gets dressed up in 1940s garb for its annual vintage weekend mid-May. It’s also a big month for food. Vegan-friendly Leeds hosts the Great Yorkshire Vegan Festival at Leeds Town Hall on a mid-May Sunday, with around 100 stalls, plus nutrition talks and cooking demos. Meanwhile Leeds Indie Food Fest brings together the city’s best independent cafes, restaurants and chefs for two-and-a-half weeks of creative events. 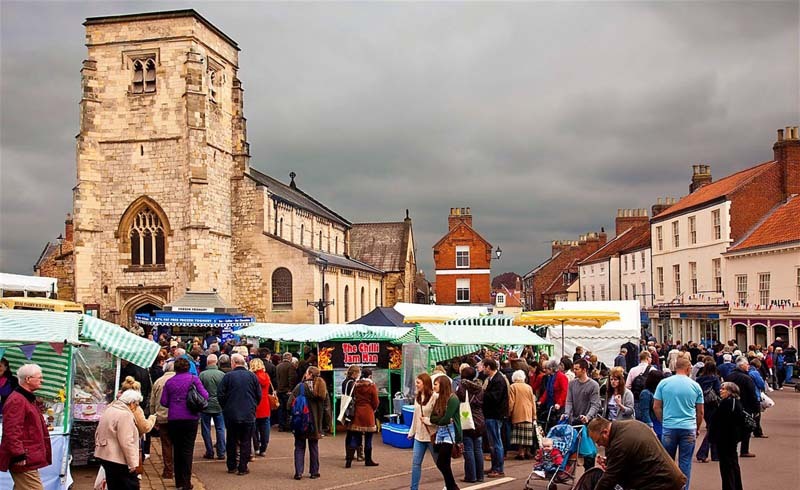 On the late May bank holiday weekend, tiny Malton crams around 30,000 people into its cute Georgian town square on the edge of the North York Moors for the Malton Food Lovers Festival. Also over the late May bank holiday, WalkFest is held in the North York Moors National Park. In 2019, the annual festival will be themed around the 50th anniversary of Yorkshire’s long-distance Cleveland Way, with a series of guided walks. For subterranean adventures that weekend, a local potholing club holds the Gaping Gill Winch Meet, a popular event where anyone over the age of six can pay to be lowered into the murky depths of Gaping Gill, an astounding 98-metre dales cave that looks like a gateway to the underworld. 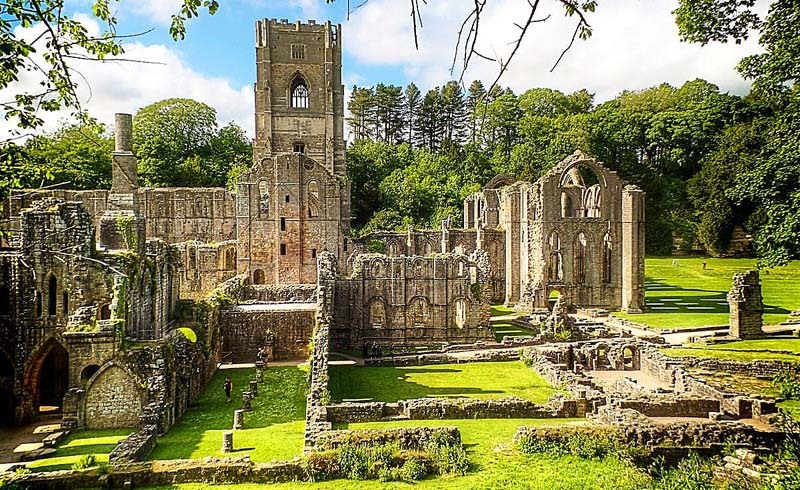 Or, for something less adventurous, the Swaledale Festival of music, art and walking takes place during the last week of the month.